Really, Heart's Desire deserves a blogpost all to itself but I wanted to mention a couple of other things as well. Clicking on the picture will take you to the pdf file to download and print. I thought my blog was getting a bit cluttered - too many things on the right sidebar. So I decided to add pages instead. If you look at the top, there are now tabs for you to navigate to other pages where I have moved the Techniques and the Patterns. It needs a bit more work... now I have the space, I will add thumbnails to all the videos and patterns which I think will be an improvement. So I removed (or moved) some things but I've added the Random Post Widget at the top which is a nice way to explore the blog and see other posts you may have not seen (even for me! I forget what I've done and it's nice to revisit past projects as springboards for new ones). And I've decided, AT LAST, to join in the fun at the 25-motif challenge. I've looked so many times at that website and enjoyed seeing other people's creations so I thought it was time I participated. So the two small squares in the previous post will count as motifs 1 & 2 and I will keep counting now. Thanks for sharing your diagram of one of my favorite patterns! I like your tabs at the top of the page. Isn't it amazing how a little change can make such a big difference? I like the pages feature too - it does look tidy! Thanks for the diagram. and thanks to Susan Fuller for allowing you to post it. I have made this heart before, a long time ago, but I remember how difficult it was to follow the written directions. 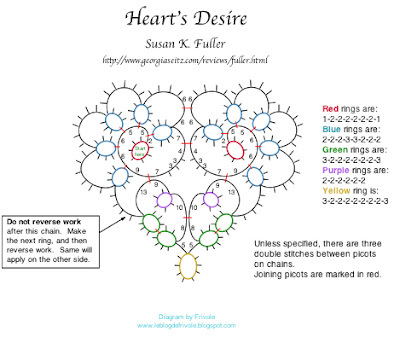 Thank you SO MUCH for the diagram of the full heart of Susan's pattern! I struggled a bit with the pattern a few months ago, and now I think I can tat it with confidence! You did an EXCELLENT job!! I'm also envious you've put tabs on your blog. I want to add tabs, but until this commenting problem is cleared up, I'm afraid to make ANY changes to my blog! And I'm DELIGHTED you've joined the 25 Motif Challenge! You have so much fabulous tatting to share! Thank you for the heart pattern I took the last one you did but have not had time to breath let alone try it out recently. I tired to make changes to my blog and it went wrong so I started a new blog for any patterns I do, but I have not updated that in a while. I have not joined the 25 motif challenge I am thinking of it. Hola Begoña, gracias por su mensaje. Somos muy afortunados de hoy en día que hay patrones libres de tantos disponibles en Internet. Espero que le gustara el patrón del corazón. Saludos. Merci d'avoir partagé ce diagramme. Ça me fait bien plaisir! Je suis allé le voir sur votre blog, bien réussi! I first did this in one pass and found it a muddle to get the spiral of the second half. I am now doing it in two halves and ending at the bottom point which seems more logical?